Gujarat State Education Board has released Vidyasahayak Bharti 2017.Candidates who are looking for government teachers jobs can apply for Gujarat Vidyasahayak Bharti 2017 at official website www.vidyasahayakgujarat.org. 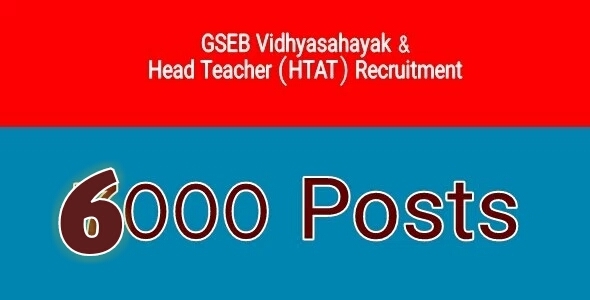 Authorities have invited applications from eligible TET passed aspirants to apply gseb vidyasahayak online application. for more details of GSEB Vidyasahayak Bharti 2017 from below. To be applicable for this latest Gujarat Vidyasahayak Bharti 2016, candidates must pass TET 2 of state to teach std VI to VIII of primary schools. Visit our site Bhaveshsuthar.in for govt jobs in Gujarat. Age limit of candidates must not be more than 35 years to be eligible for Vidyasahayak Gujarat Recruitment. Based on the number of applications and vacancies ratio board will release merit list of selected candidates for GSEB teacher vacancies. Interested candidates refer official GSEB Gujarat notification 2016 available in Gujarati medium before online apply at official website vidyasahayakgujarat.org. It is good prospect for those who are waiting for jobs Gujarat TET recruitment for primary teacher jobs. Subject wise vacancies and steps to apply online application for Gujarat vidyasahayak bharti are below. Apply before the last date, make regular visit for latest updates on Gujarat teacher recruitment.